My adventure with menhirs, boat-shaped houses, breathtaking landscapes, banquets and selfies at a funeral… and chasing dead bodies in houses! 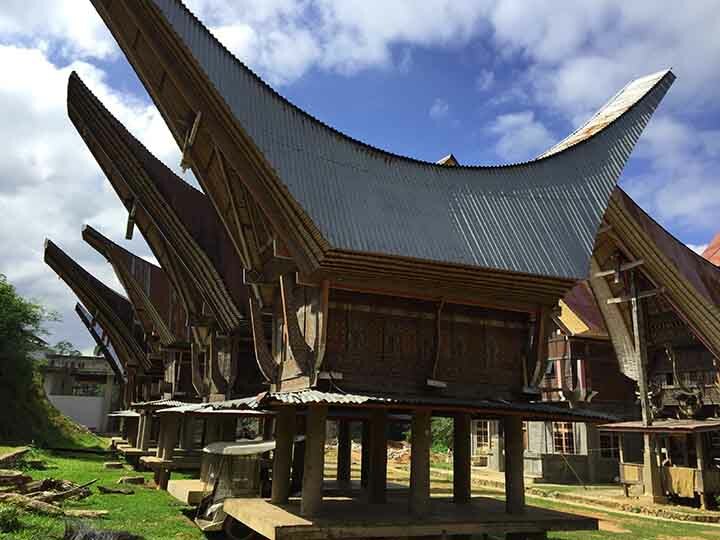 Toraja is a region of Sulawesi – one of the least touristic islands in Indonesia – with a culture unique in the world, built around the worship of the dead, meaning of the corpse itself! 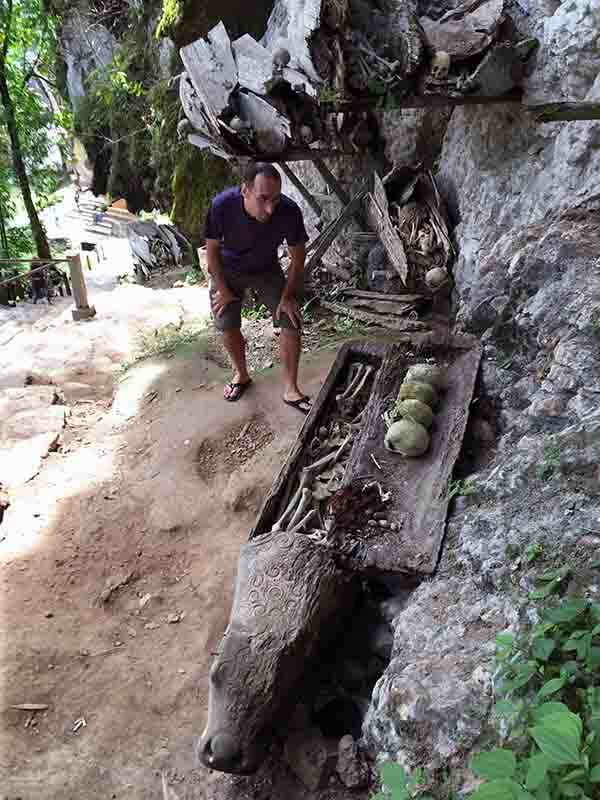 I discovered it thanks to travelers I met in Southeast Asia and who made me “die” of curiosity. You must earn this experience. 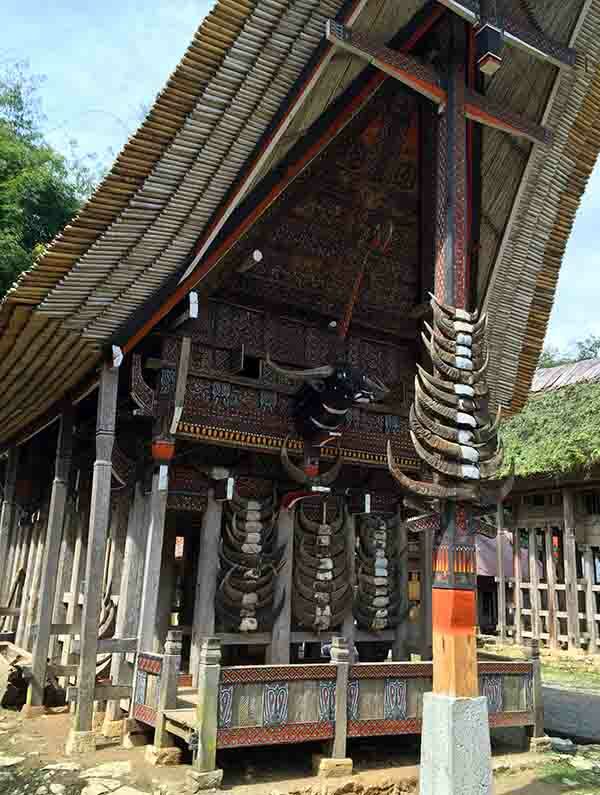 As I said in older posts, transportation in Indonesia is incredibly slow, but the one to Toraja stand out. To travel the 220 km from Makassar, the island’s main airport, it takes 8/9 hours by couch! 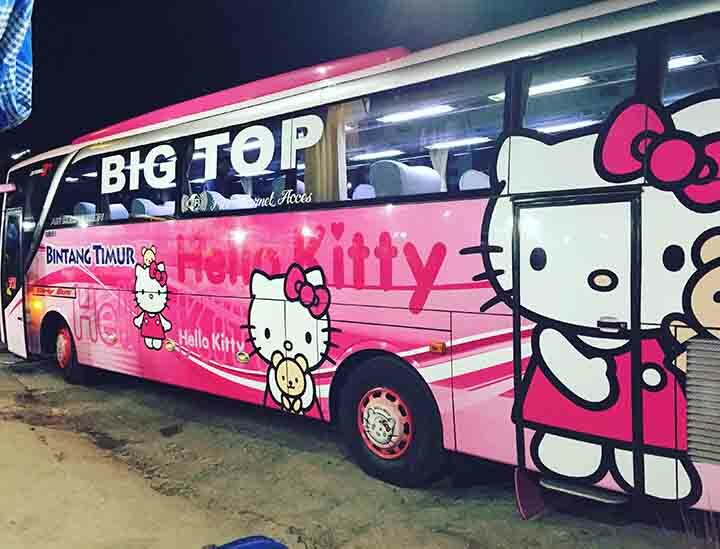 Mine was really cute – in Asia everybody’s crazy about Hello Kitty – and even with comfortable seats, but the trip was horrible. It was night and I couldn’t see the road and I felt that the driver was driving like crazy; only on the way back, with the day light, I realized we were on narrow mountain roads. 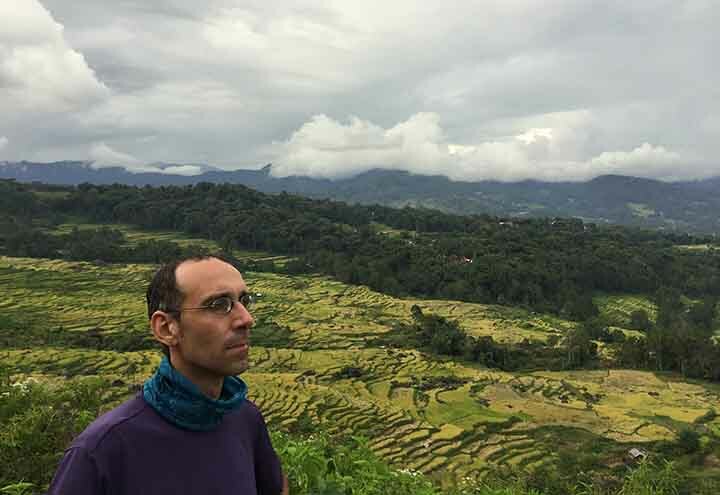 In short, at dawn on a August Sunday morning I arrive in Rantepao, the region’s capital town, and introduce myself to Yudha, the boy who agreed to host me. 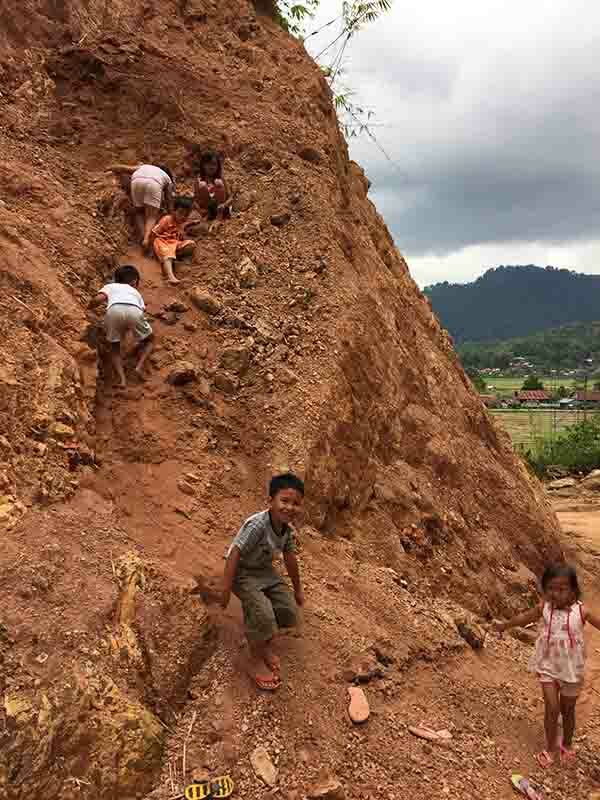 His home is at the bottom of a dirt road next to a rice field. 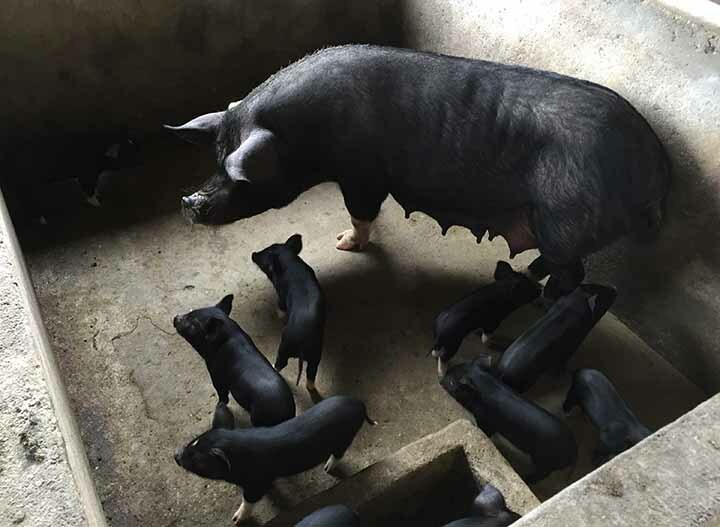 A group of noisy black pigs reveals its presence behind the house. 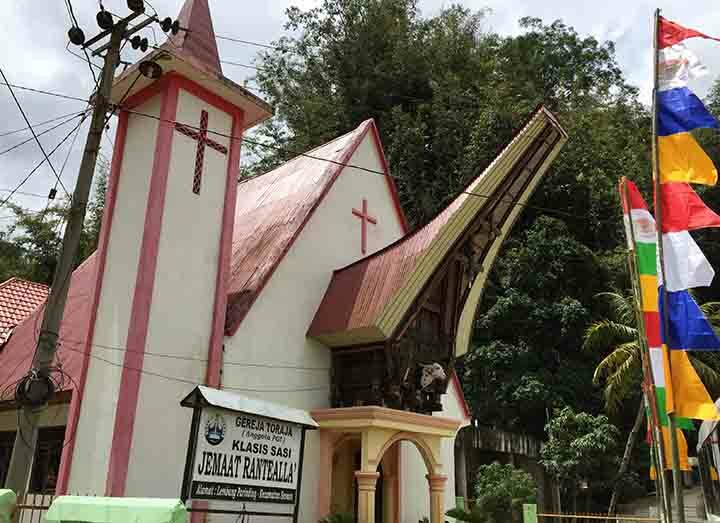 No surprise, Indonesia is the largest Muslim country in the world but Sulawesi is predominantly Christian-Protestant. And in fact, shortly thereafter, Yudha tells me he is going to Mass. I take the opportunity and go with him. 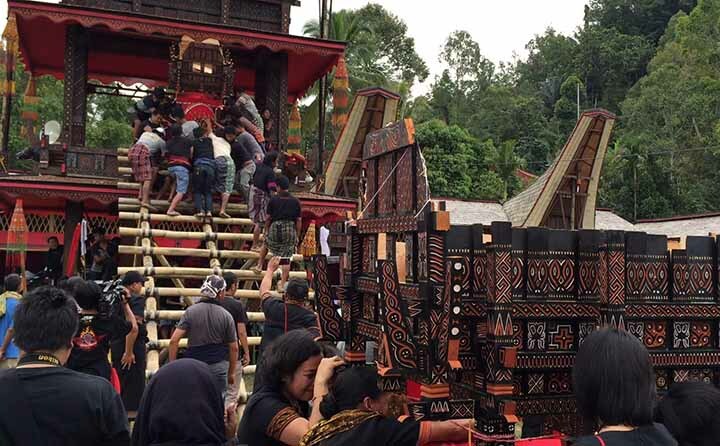 How will it be a Mass in Toraja? In a few minutes we get to the church, a very simple building. For the first time I assist to a Protestant (Lutheran in fact) service. And for the first time I see a woman doing it. Most of the time people are singing psalms reading the lyrics projected on the wall. 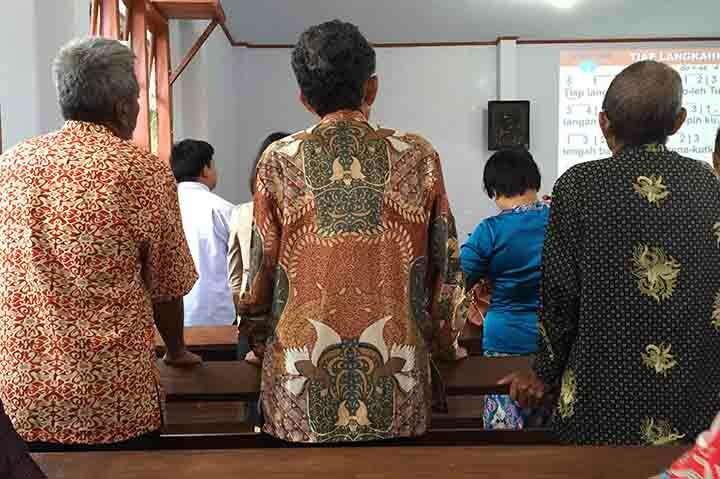 I can’t take my eyes off the colorful batik shirts of the men. When all is over I’m impressed by the pastor shaking hands with everybody. At lunch time we try some local specialties. 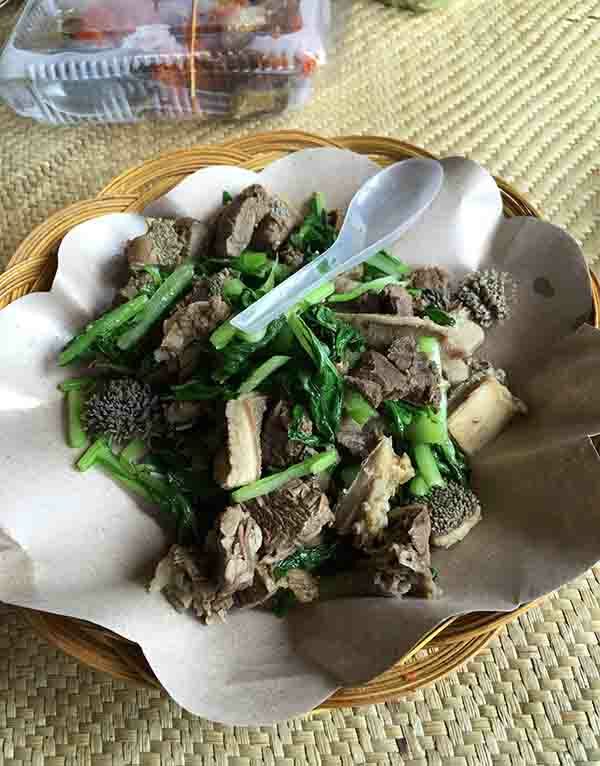 In Indonesia food is generally good and I am curious to try pork, which is absent in other Indonesian islands. Unfortunately this is a huge disappointment. The dishes are not inspiring and the meat tastes like rubber. They use in every dish or so a local spice called pamarasan – it looks like coffee – that doesn’t taste bad. But overall what I had ranks among the worst food I’ve tried in Southeast Asia. Luckily I come across a street food stand serving the classical Javanese fried snacks: bananas, leeks, tempeh wrapped in puff pastry. And I’m instantly in a good mood again. In the afternoon I finally see the typical local homes, with their curious boat-shaped roof. They say they are always heading north, towards China, in memory of the country where the ancestors came from. 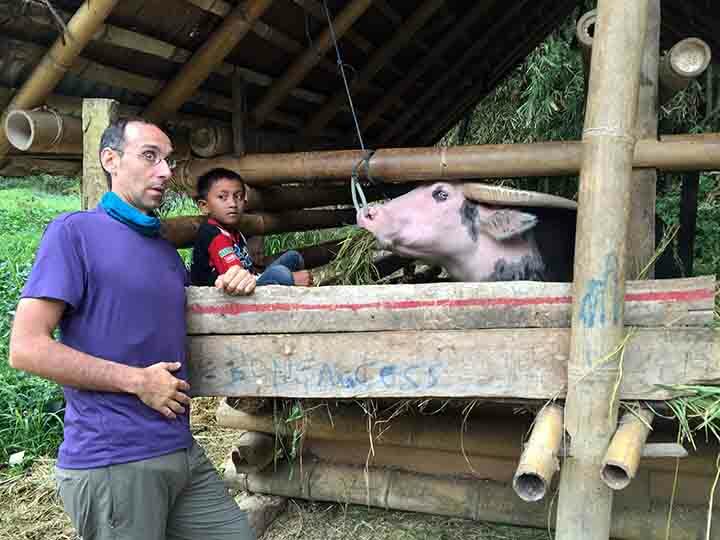 Yudha explains me that those in the middle are actually for food storage. Meanwhile some kids are playing nearby. When the night falls we go back you home and I cook Italian spaghetti using the ingredients available on the spot – including some scary cheese. Everyone is excited, a plate is brought to the neighbor and little Rara goes crazy eating the first pasta of her short life. The scene fills my heart and reminds me once again that I travel for people not just for places. The next day, I’m determined to fulfil the purpuse of the trip. 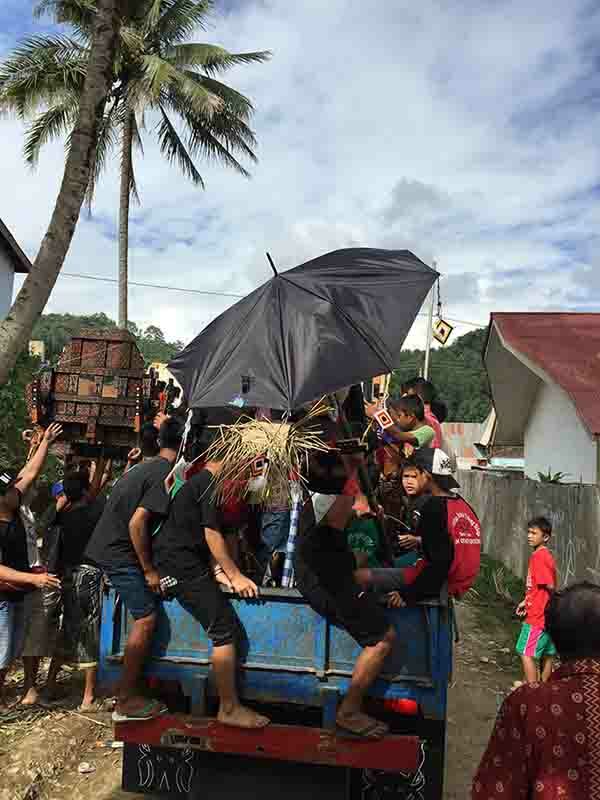 I want to find a funeral to witness the Torajan rituals and a dead corpse. Early morning I’m heading to a shop Yudha sent me to rent a scooter, but I won’t get there. As I walk on the street a shy boy approaches me and asks me if he can guide me. We make a deal. 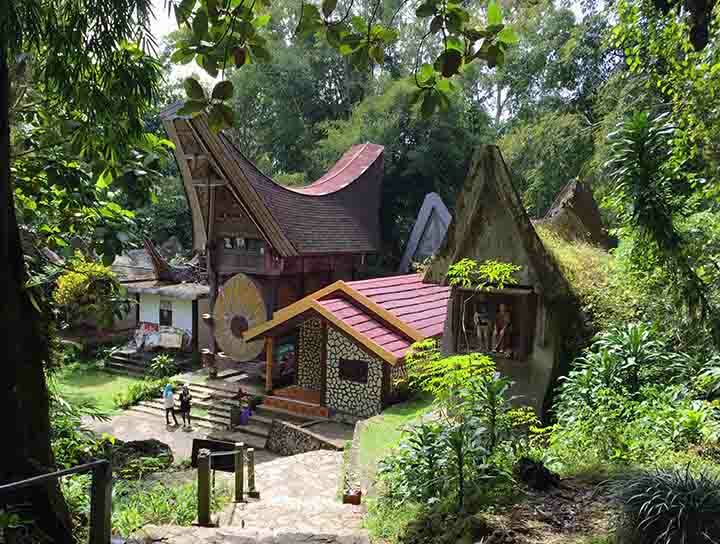 He will take me to the most interesting places in Toraja and to a funeral. The guy is called Renol – his father was a fan of the French racing team – and we first stop at his home. 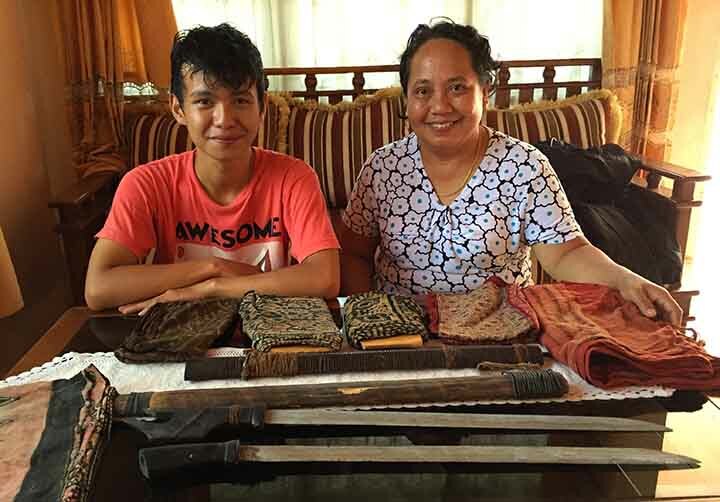 There I meet his mom Nety and his sister and I’m shown some family relics – swords (labo’) and traditional clothes (maa’) – “more than a hundred years old.” I am quite sure to be the first foreigner seeing them. 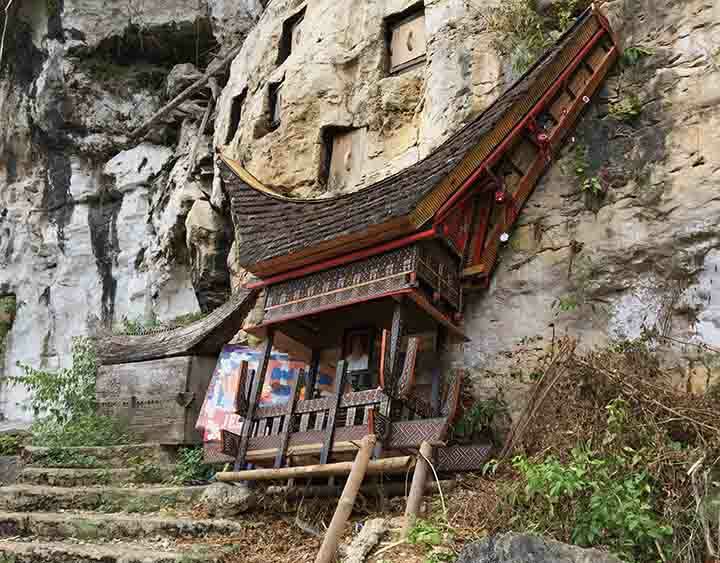 Our tour starts with the best preserved traditional village, Ke’te Kesu’. 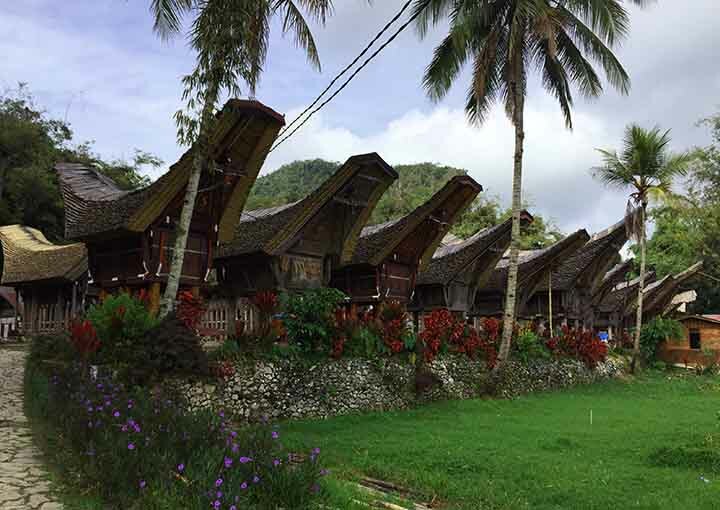 The ancient part includes about 30 beautiful boat-houses, decorated with buffalo sculptures and horns and traditional fabrics. 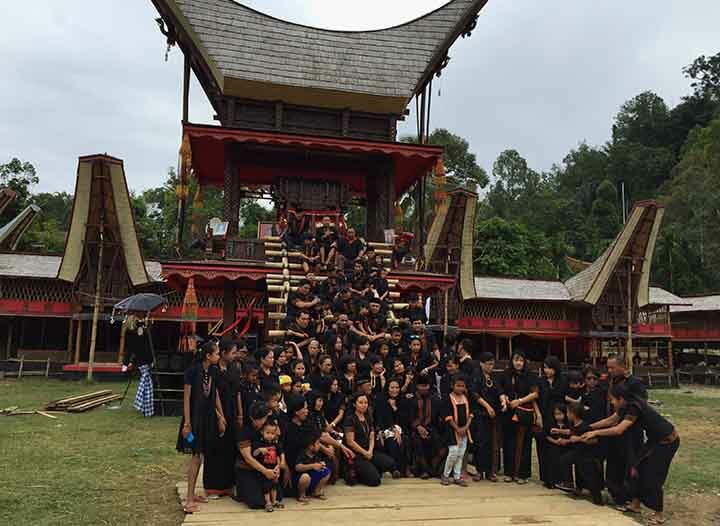 Here I see some of tourists, almost all Indonesians or Asians, but also a group of four girls in traditional dresses rehearsing a song (watch the video). Renol tells me it’s a famous love song. Nearby the houses there are some big graves, also with boat-shaped roofs, with drums and pictures or statues of the deceased. Obviously those belong to important people. Ordinary people, instead, are buried in niches dug in the rock. I begin to understand how the funeral takes place. The dead is brought on a sort of ark, which is abandoned outside the tomb. The graves recall animals: buffalos for men, pigs for women. There are bones and skulls everywhere. I’m told that a large tomb may contain up to 25 people and that there is a etiquette to follow. 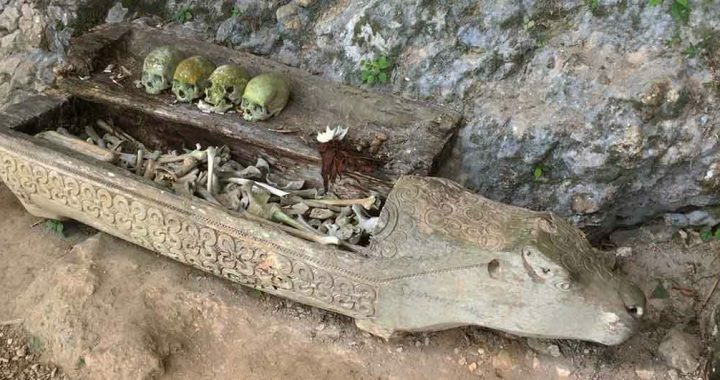 Do not move or take away human bones – a tourist did it and was hunted by nightmares. And you must ask permission (tabe) to the dead before taking a picture. Watch out you compulsive selfie takers! Before leaving I see a beautiful buffalo who twisted a rope around his horns, I try to help him but he doesn’t seem to be very friendly. At this point I’m expecting to see boat bows everywhere. And, in fact, here comes one standing out from a church. But, surprise, I find something really classic. 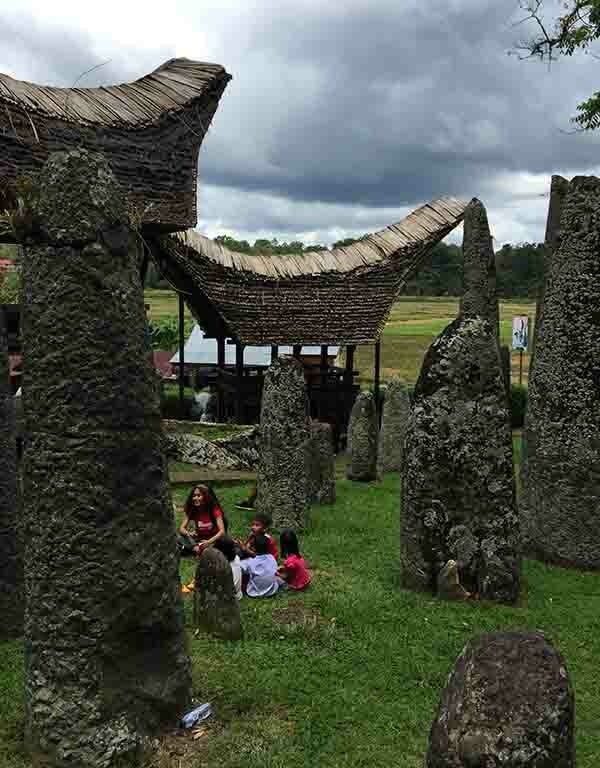 The site of Bori ‘Kalimbuang is full of menhirs. And even more classic, the rich and powerful men compete for having the longer one. I can imagine what Freud would have commented. To bring some additional folklore, some kids are having fun singing a song. They are recording a spot for a drink. Our bike ride continues up to the viewpoint of the area, at Tirinbayo. Rice fields everywhere, grazing buffalos, yellow and green nuances. Here you feel the king of the world. In the village of Rantepangli we finally come across a funeral. The main square is basically a big outdoor theater. A tower with two sarcophagus at the center, surrounded by covered places where family, villagers and tourists are watching. Yes, tourists are welcome, indeed they give prestige to the ceremony. 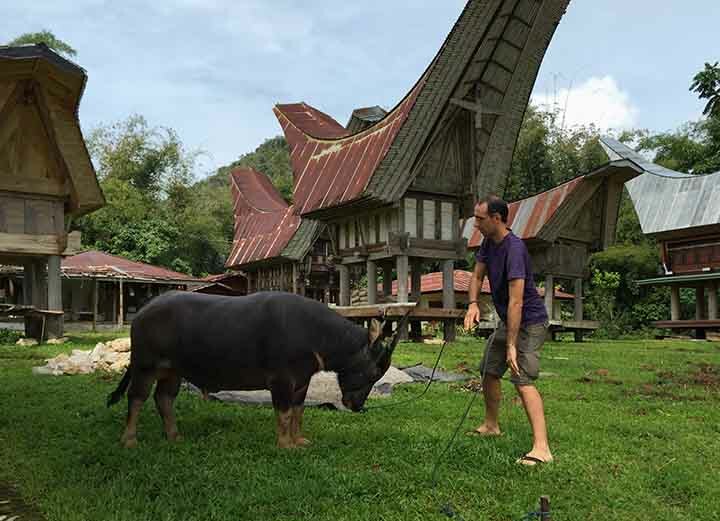 In fact, for the first time in Toraja I don’t feel like the only stranger. Next to me are some Poles, over there some French and Germans. When we arrive they are offering to eat. 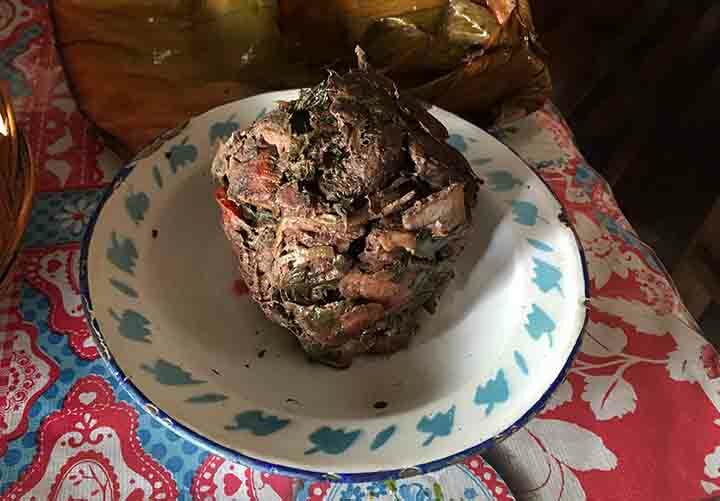 The menu includes rice, ginger chicken, catfish with tomatoes, buffalo tripes, vegetables and then stewed pork with daun singkong (cassava leaves). I’m told that the animals were slaughtered at the beginning of the ceremony. I’m not sorry for being late. After the meal, the priest and the community leader praise the two departed, a man and a woman. Afterwards, the all take a collective photo. 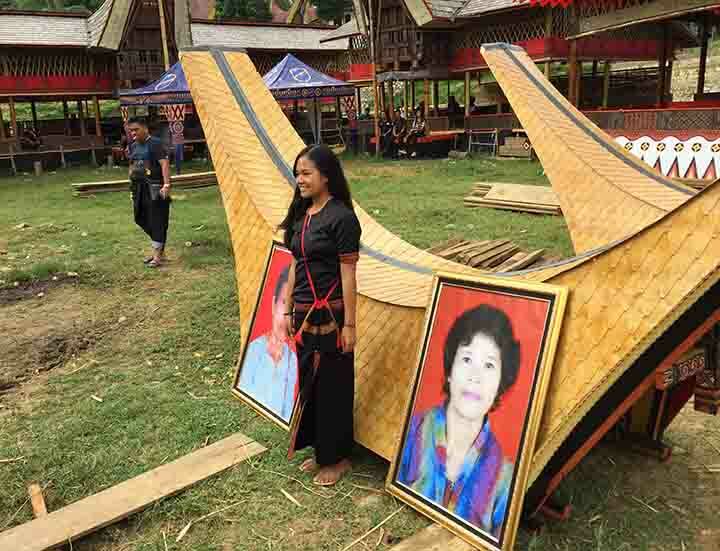 The atmosphere becomes hectic when the two coffins are brought down from the tower: women cry, men dance and all take a selfie with the portraits of the beloved ones. 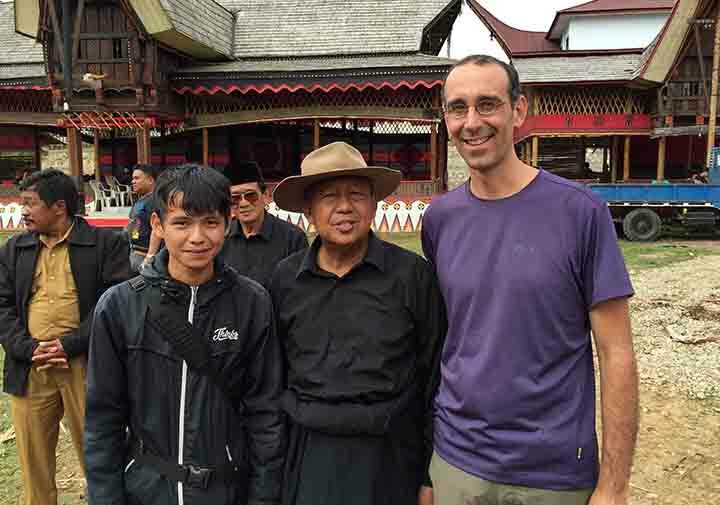 I am also invited but for a picture with Toraja’s president. Suddenly, I see people fighting: someone threw 20 and 50 rupiah bills. Then, two vans arrive, the ark-coffins are loaded and a parade starts with loud music. Just a few km and we get to the cemetery, coffins are loaded down, the arks are thrown away and everything is over. Few moments after we’re riding the bike down a steep little road – I wonder at each curve how if will be possible to go back – and end up into a village in the woods. 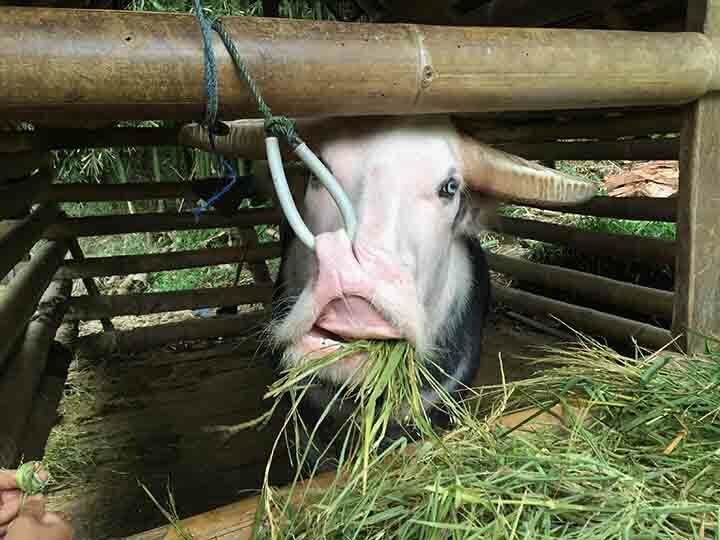 There we find a young cousin who’s feeding a nervous buffalo, tied to a ring on his nose. They tell me that they don’t use him for work. he will be sold for a funeral for some 450 million rupiah (about 3,000 €). I am still amazed at how much money they spend here on funerals. The 450-million-buffalo’s eyes are mesmeric, but his threatening puffs bring me back to reality. We get into the house. Renol shows me the room. “Hi grandma”, he says, and I realize he is telling her there’s a visit. I enter cautiously, the room is dark but I don’t smell anything strange. There is a kind of canopy and a framed picture of the lady. Grandma is wrapped in a colorful nylon bag and you cannot imagine the shape of the body. In short, no bones and skulls. But I’m not disappointed at all. 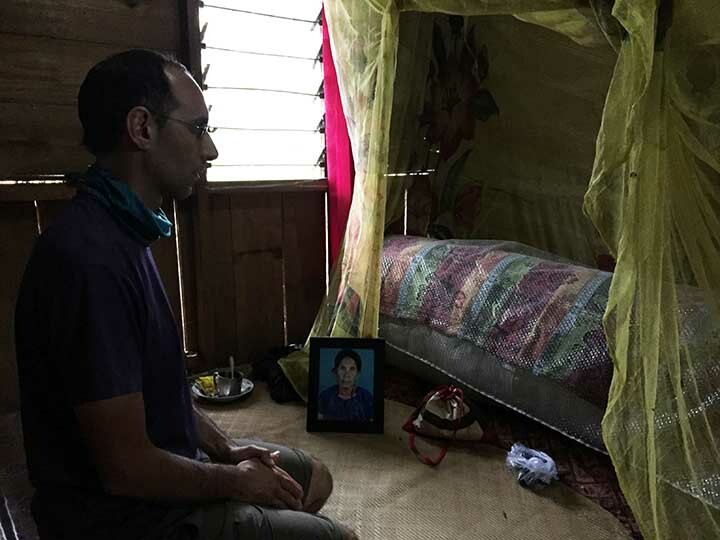 At the end of a two-day chase for a corpse in Toraja, I feel that I have found a person. I stay a few minutes contemplating. Then we say goodbye to grandma and go back to where we came from. 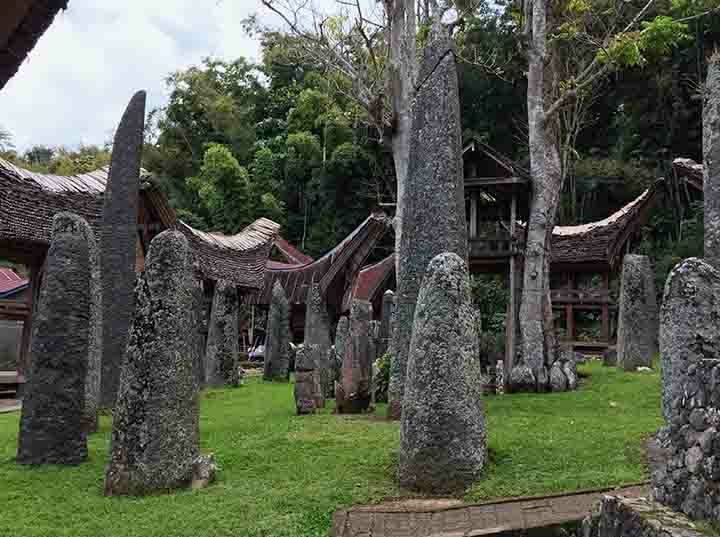 Anything to say or ask about Toraja? Leave a comment! 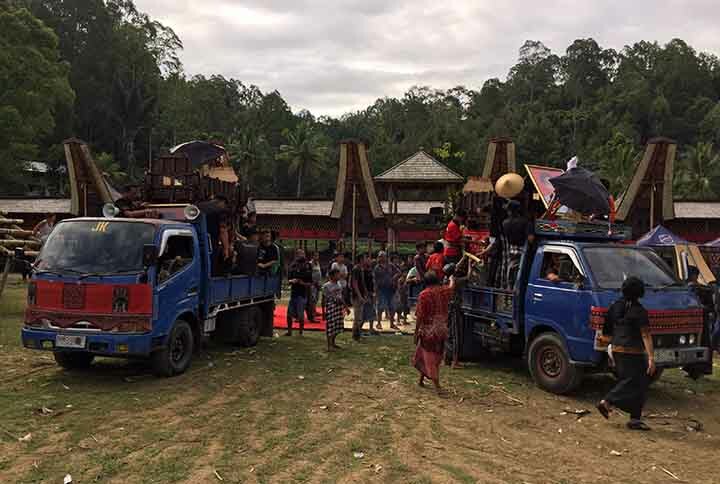 Posted in Travel and tagged funeral, indonesia, landscape, ship, street food, sulawesi, toraja.